According to the Cyprus Hallmarking Law (Ν.52/2009) and the Convention of the control and marking of articles of precious metals whereas Cyprus is a full member, the use of Nickel for coating precious metal articles is prohibited. Platinum, Gold, Silver or Rhodium. A necessary requirement is the coating thickness to be less than 2 micrometers (μm). Additionally according to the European Regulation (EC) No. 1907/2006 concerning the Registration, Evaluation, Authorisation and Restriction of Chemicals (REACH), Nickel use is not permitted in articles coming into direct and prolonged contact with skin. Therefore all articles made of Gold or Silver which are Nickel coated, are returned unhallmarked to the owner either for remanufacture or re-export to the country of origin. 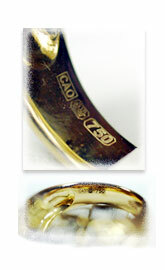 The permissible coatings on precious metal articles are provided in paragraph (6), of article 13, in the relative legislation, (N.52/2009). The restrictions of use of Nickel on articles coming into direct and prolonged contact with the skin are provided in paragraph 27, of Annex XVII, of REACH regulation, as amended with regulation 552/2009/EC.